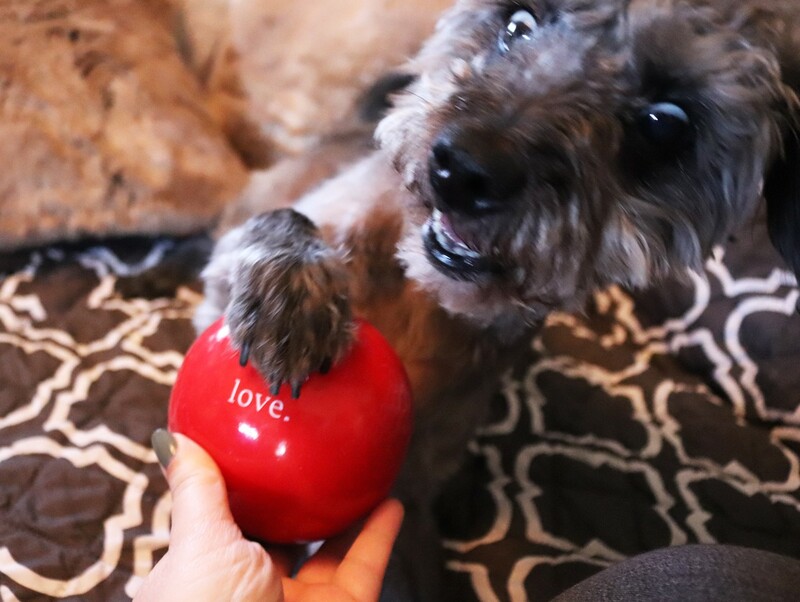 I gave my little dog, Riley, his Valentine’s Day presents early this year, and he was so excited! I had to take some action shots to share with you. The Orbee Tuff dog toys from Planet Dog are SUPER durable and completely non-toxic and safe for your little (or big!) dogs. Dog owners love them because they are BPA-free, phthalate-free, FDA-approved (I didn’t realize the FDA approved these kinds of things, but awesome), and of course, cruelty-free. These safe dog toys are infused with natural mint oil, which can help your dog’s breath (not a ton, but I’ll take any help I can get in this department). There is a hole in the middle so you can add your dog’s favorite treats (which keeps them busy for hours!). The best part is that you can throw them in the dishwasher to clean them, and if your dog eventually chews them to bits, you can recycle what’s left! Planet Dog manufacturers these in the USA and they have a 100% guarantee. Extremely durable, made in the U.S.A. 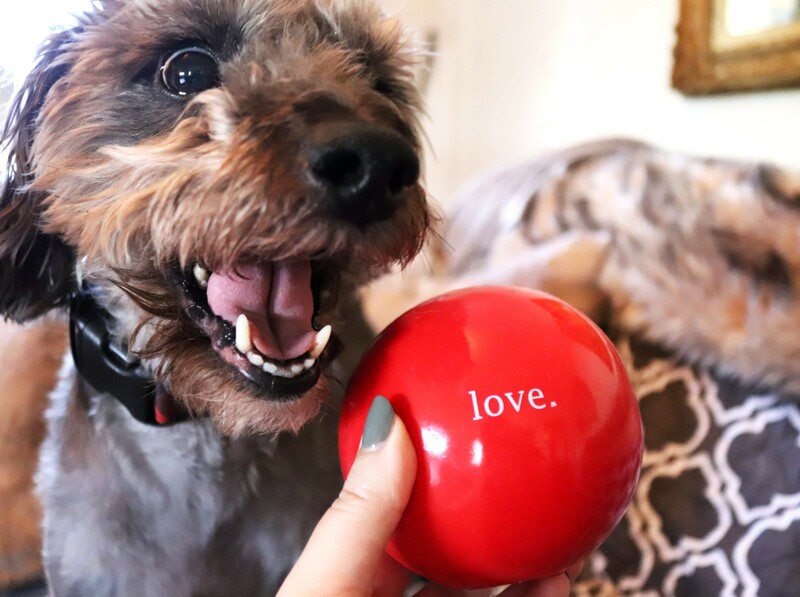 Planet Dog comes out with new safe dog toys for each holiday (in fact you may have seen them in my dog lover’s gift guide). 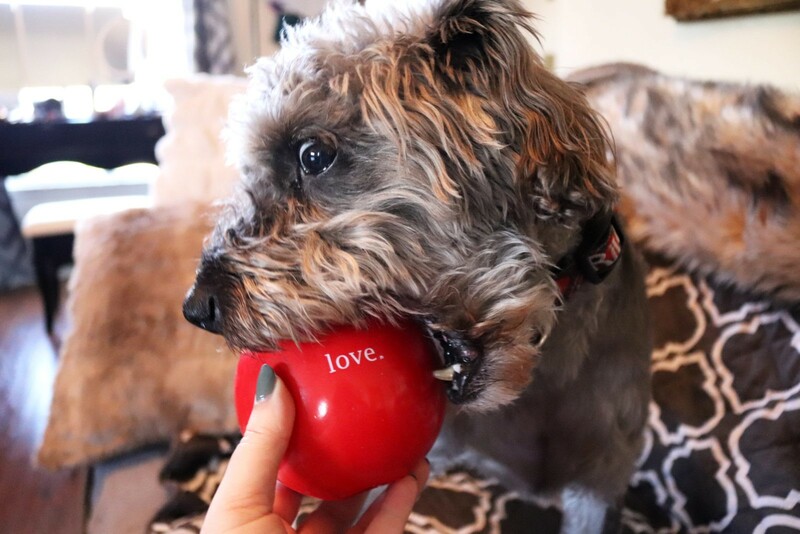 The latest are these cute Love Valentine’s Day Orbee Tuff dog toys – there is a pink one and a red option, and they come in 2.5 (for small to medium dogs) or 5 inches (for large dogs). They have many design options, including these cute fruit and veggie safe dog toys! So cute! – Both Riley and the toy! What a cutie Riley is, and he’s clearly thrilled with his new swag. Possibly stupid question – how does he get the treat out of the hole within the ball? Does it squeeze out? 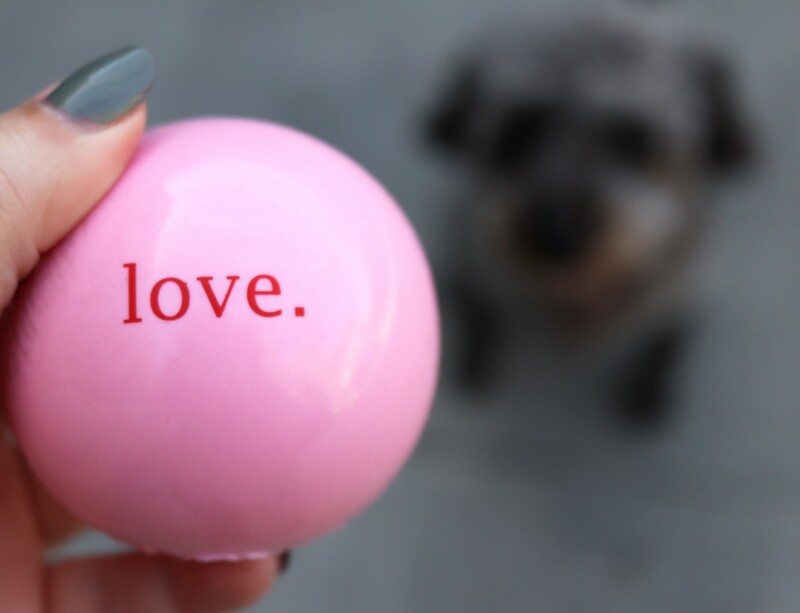 I’m always in the market for safe dog toys, and these are so cute! 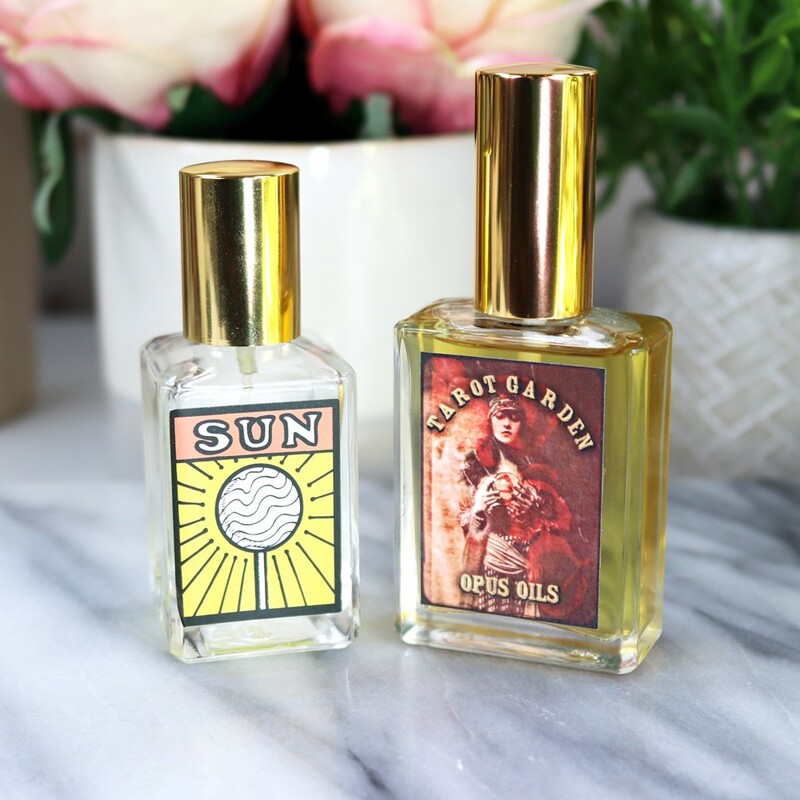 I love that they are non-toxic, BPA and phthalate free and FDA-approved! When my dog was younger he loved toys like that. Now if I give him something he prances around the house with it but won’t play with it. It’s so cute to watch him bring me the toy over and over even though I know he’s just showing it off. I didn’t know that dog toys would be FDA approved. Riley is adorable! I think this was a hit with him!!! Today I put treats that can fall out eventually, but you can also put larger treats or peanut butter or something that they can lick through the hole. Keeps em busy! Oh Riley you stole the show! Look at you bebe, so cute! I can’t even with his expressions LOL! What a cutie!